In Hampi there is a temple. In that temple lives an elephant. Her name is Lakshmi. Sometimes her trunk looks like a giant strawberry. Meet Lakshmi. Sometimes her trunk looks like a strawberry. Lakshmi is holy. According to the many hindus who visit Virupaksha temple daily, she is a living incarnation of the god Ganesha, a symbol of success and a remover of obstacles. If you hand her a ten rupee note, Lakshmi will give you a blessing. She pinches the money with her long trunk, delivers the cash to her trainer, the mahout, and then, in a movement simultaneously exhilarating and frightening, she dutifully extends herself to rest atop the giver's head. Don't even think about trying to shortchange her. She's smart enough to decipher the difference between rupee denominations and will accept money gladly but will fail to deliver the expected blessing if it's not enough. Not that fifteen cents will really break the bank of any Westerner traveling in India, but you'd be surprised at how many people try to escape payment. With beautiful long lashes surrounding wide eyes that look too small proportionally to her massive leathery body, Lakshmi is the sweetest elephant I've met in all of India. Her trunk and forehead are painted with red and orange patterns, reminding me of large colorful handmade bindi dots. The designs change daily. Lakshmi is the sole elephant at Virupaksha temple, which has been a holy site since the seventh century. In fact, she's the first permanently installed holy mammal I've met after visiting dozens of hindu temples across the subcontinent. It's my understanding that most elephants merely stop by places of worship for special occasions. 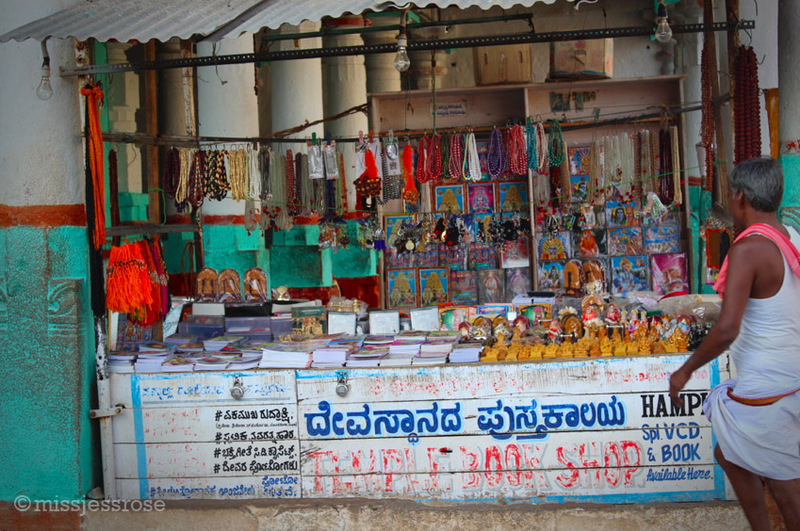 But here in Hampi, Lakshmi has a permanent full-time job. With a few months off in summer to roam free in a jungle camp, she seems content to be working now. It's a good thing she appears alert and happy because her presence at the temple is economically important for the locals. Lakshmi supports the livelihood of not only her two handlers—the mahouts, and their families—but also of the men who harvest grass and sugarcane for feed. Additionally, local vendors benefit from her presence since tourists buy bananas, mangoes, and watermelons to offer as snacks. This is how such a simple act of blessing supports a small community. Even so, the work of training and caring for an elephant in India is not a high caste job. People who care for elephants are poor. 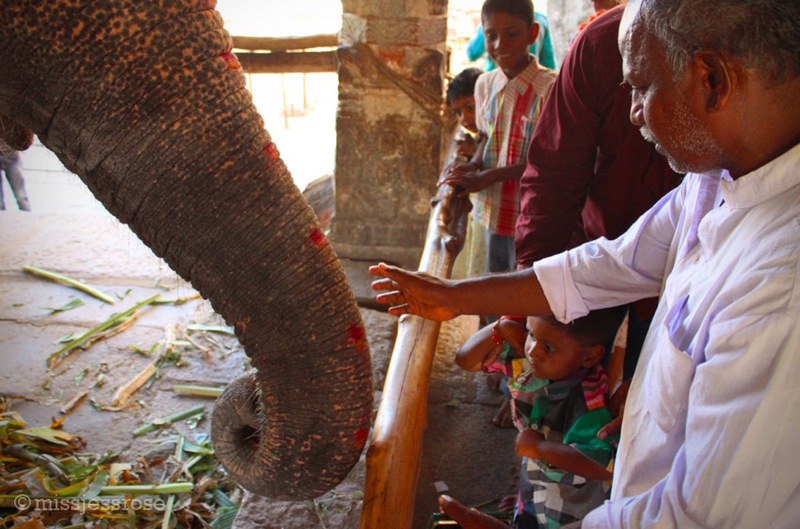 Becoming a mahout is a full-on job handed down from father to son. And since elephants typically bond with a single person, the mahout's job lasts a lifetime. Lakshmi's life hasn't always been charmed. When she was four years old she accidentally killed her trainer which landed her several years in elephant prison. She was branded a threat. It took time, but since then she's been rehabilitated thanks to the dedication of her current mahout. Now she is beautifully trained. When I watch her move alongside her trainer, it's clear that the two are having a conversation. He shouts indecipherable orders in hindi and she lumbers along next to him listening and silently responding. Sometimes it's good to be reminded that we humans are quite small comparatively. 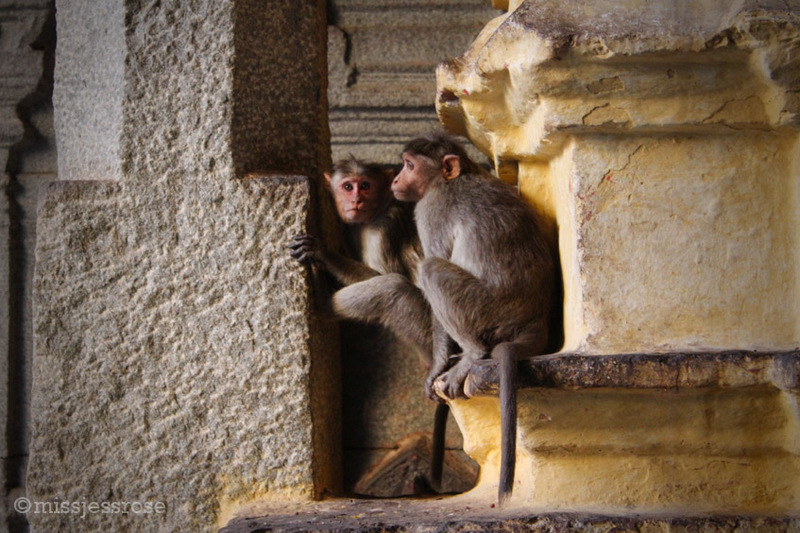 During my time in Hampi I begin every day watching Lakshmi's morning ritual. 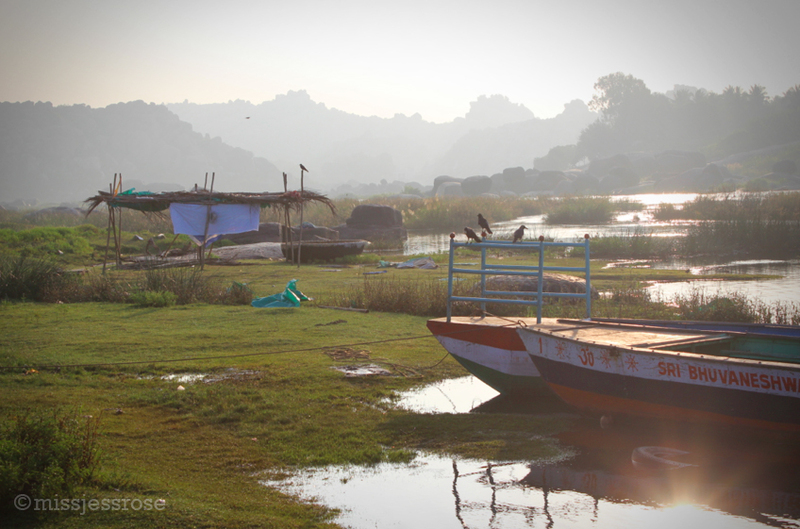 Around eight in the morning she lumbers down worn stone steps to join clusters of Indians sudsing up in the ancient Tungabhadra River. Groups of people, mostly men, wash their hair, brush their teeth, and launder their clothes alongside the elephant. Garbage floats downstream amidst pockets of white bubbles. Half submerged ruins from the Vijayanagara empire peek out from beneath the holy waters. Most mornings, a crowd of tourists gather to watch this spectacle. The locals don't seem to think anything is out of the ordinary. Apparently taking a bath beside an elephant is no big deal. On some mornings, the river is more crowded than others. These round woven boats are called coracles. I'm a horse person and have been since the age of eight. I know how to move around big mammals. One reason I'm so taken with Lakshmi in particular is that her spirit hasn't been beaten down like other elephants I've met, their power and beauty masked by garlands of heavy chains. Lakshmi moves about freely, unhindered by any type of restraint. Instead, she listens to the calls of her handler with respect but not lacking attitude. The longer I watch her, the more impressed I become. One morning as she lumbers out of the river, a tourist begins hand-feeding Lakshmi bananas. Almost immediately a sick yapping scraper dog from the village circles her huge feet, jealous of the food. The dog's high-pitched bark is annoyingly insistent and the usual crowd of onlookers become agitated. In response, Lakshmi flares her trunk at the dog as if to say scram. Then she turns silently towards the river, dips her trunk into the water, and with perfect comic timing douses the scrapper dog with a spray. We arrive for our regular morning visit bearing bananas, old mangoes, and watermelons. Crowds flow through the temple in waves—school kids, families on pilgrimages, Western tourists. 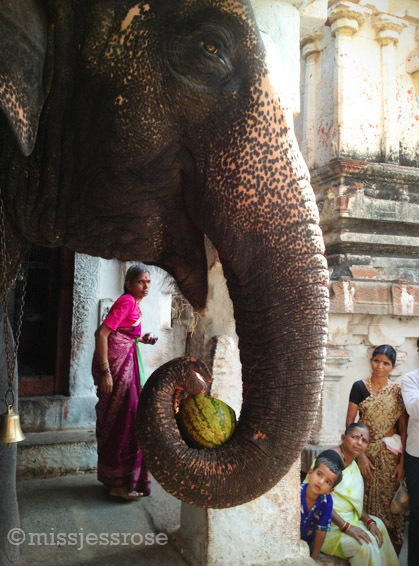 During the quiet moments in between the crowds we offer Lakshmi treats. She sniffs out the fruits and grabs them from our hands with her trunk, tossing them inside her pink mouth. I watch her when it's quiet and I watch the crowds watching her when it's busy. I see what great power this animal has over us humans. She's strong, grounded, and powerful in a gentle way. It's impossible not to be taken with her. How fortunate I feel for this chance to spend time so intimately with such a special creature. I could stay for hours. It's a funny thing to have an elephant nose come sniffing at you. When we run out of snacks, Lakshmi's curious trunk comes poking around looking for more. She discovers something in my purse and I remember that I have cashews inside. I pull out the bag and offer her the nuts one by one. She patiently accepts each cashew, even though they seem unimaginably small when tossed inside her massive mouth. On our last day in Hampi the mahout asks if I'd like to go for a ride. I'm beyond excited. I cannot imagine a better way to say goodbye to Lakshmi. I climb up onto the remains of an ancient wall and maneuver on top of her, straddling her neck. What a crazy feeling, to ride her without any chains, ropes, guidance—nothing! At first I'm scared, searching for my balance. Her gait is irregular and lumbering, quite different from that of a horse. Lakshmi follows her mahout down the cobblestone street, past the now familiar fruit vendors and locals hanging laundry to dry. I'm distracted by the thrill of being on an animal so huge, I'm focused on feeling her rhythm and movement. I remind myself to look up, to take in the scene around me. And when I finally do, the river glistens down below, the toppled ruins from ancient Hampi sit immovable surrounding me, the street is alive with life. I smile, soaking it all in.